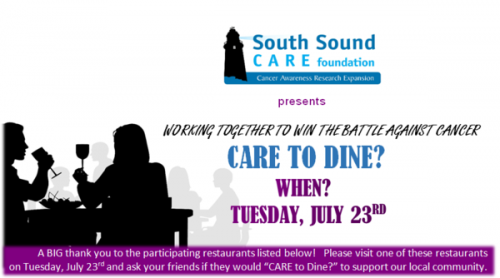 The inaugural Care to Dine event is this Tuesday, July 23, and benefits the South Sound CARE Foundation, which raises money to provide cancer clinical trials to residents in the Pierce County and South Sound communities. Participating restaurants will donate 20 percent of proceeds raised on July 23 to the foundation. It’s always a great reason to dine out when charity is involved!